Papaya and its seeds are very important for health. We have collected the health benefits, do read and implement it. 1. Take one teaspoon papaya seeds powder three times in a day with lukewarm water. It is beneficial in stomach pain. 2. Use mixture of papaya seeds powder with rose water. It is effective to cure piles. 3. The mixture of buttermilk with one teaspoon papaya seeds powder is beneficial in piles. 4.The mixture of lukewarm water with one teaspoon papaya seeds powder is effective in joint pain. 5.The mixture of papaya seeds water with lukewarm water is beneficial to remove stomach worms. 6.The mixture of one teaspoon papaya seeds powder with half lemon juice is beneficial for liver. 7.According to Karachi university research, papaya seeds contain flavonoids, which keeps kidney healthy. 8. Papaya seeds have anti-bacterial quality. The mixture of honey and papaya seed powder is beneficial for wound or injury. 9. Papaya seeds has oleic and palmitic acid, which is effective to protect from cancer. 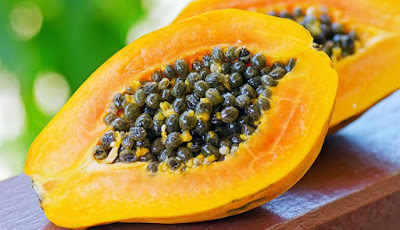 10.Papaya seeds are effective to remove intestinal parasites from children. 11.The mixture of papaya seeds powder, honey and lukewarm water is effective in viral fever.